Did the Eagles’ offseason additions improve their defensive line? Brandon Graham (left) returns to the Eagles' defensive line on a new contract and Derek Barnett (right) will be coming back from injury. Chris Long's return, however, doesn't seem likely. 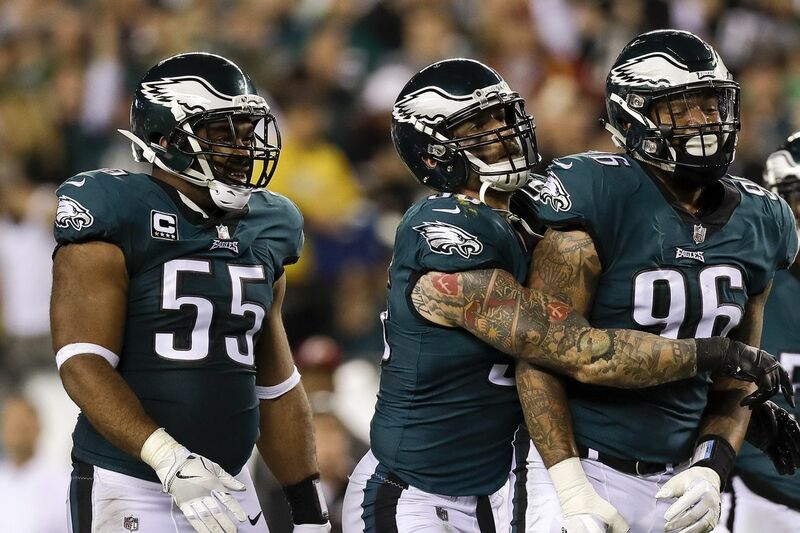 PHOENIX – The Eagles have long prioritized the defensive line position, and continued to emphasize its importance this offseason by retaining Brandon Graham and signing free agents Malik Jackson and Vinny Curry. But they also traded Michael Bennett and all but ensured that Chris Long won’t return by acquiring Jackson. Bennett and Long, despite only starting for a combined 11 games (all Bennett), were the Eagles’ most productive defensive ends in 2018. They accounted for 15½ sacks, 18 tackles for a loss, 51 quarterback hits and four forced fumbles. Even if an argument could be made for parting with Bennett and Long — and there were/are reasons — that’s a lot of big plays to replace. Jackson and Curry won’t necessarily be asked to match their production. It could also come from a still-in-his-peak Fletcher Cox, a returning-from-injury Derek Barnett, a more-healthy Graham, several unproven youngsters, or a yet-be-drafted defensive lineman. But Jackson and Curry will shoulder some of the responsibility, and the Eagles are banking on both returning in some form to their pre-2018 selves. The offseason is still not over, but the process of moving from free agency to the draft has begun, as Eagles executive Howie Roseman said Monday at the NFL owners’ meetings. As the roster stands, it’s fair to question whether the moves made at defensive line improved the team. The Eagles dealt Bennett and a 2020 seventh-round draft pick to the Patriots for a 2020 fifth rounder. Roseman did well to get something in return for a player he was prepared to release. But if Bill Belichick still found value in Bennett, who will make a relatively affordable $7.2 million this season, why didn’t the Eagles? Roseman wasn’t going to give the reasons for Bennett’s departure, but when Graham was re-signed for four years at $40 million, it all but signaled his end in Philadelphia. Bennett wasn’t pleased with coming off the bench last season and he made his thoughts known both in public and (more emphatically) in private. It could be debated that the Eagles, if it were an either-or proposition, kept the worse player and paid more for it. But Graham’s off-the-field value was worth more and the Eagles, quite simply, didn’t want a potentially unhappy Bennett in the locker room. They made it work last season, though, and there must be some leeway, especially for players as productive. Bennett had eight sacks in the final 11 games, including the playoffs, when he jumped into the starter’s role following Barnett’s season-ending shoulder injury. And most of those sacks came from inside rushes on third down. Jackson had only 3½ sacks last season, and was benched in the second half because he said coaches cited his struggles as a run defender. He averaged six sacks in his previous five seasons, though. Roseman didn’t want talk about Long as if he were gone. He’s still on the roster and has one year left on his contract at $5.6 million. But Long has said that he would rather retire than return in a lesser role, and Jackson’s inside presence on third downs means that Graham will return to being predominantly an edge rusher. And that is where Long thrived, perhaps more than any other Eagles defensive end, per snap, over the last two seasons. But the Eagles aren’t likely to give him as many third down opportunities with the financial investment in Graham and the first-round draft investment in Barnett. The Eagles recently restructured Long’s contract and moved a $2 million roster bonus to after the draft, in part, to give him more time to decide his future. But the team essentially made its choice, knowing his preferences, and it’s unlikely he plays another down for the Eagles. Roseman probably doesn’t want to outright release Long, a popular player in Philly, who made significant plays in some of the Eagles’ biggest games the last two seasons. If Long was given the freedom to find another team, perhaps Roseman could manufacture some sort of trade. The addition of Curry was likely more a byproduct of than an impetus for Long’s decision. The Eagles had to move on and they needed to pad their depth. Curry, who signed a one-year contract for $2.5 million, won’t threaten the primary third down rushers because run stopping has essentially become his strength. He has averaged only three sacks over the last four seasons. Curry, during a conference call last week, cited a high ankle sprain as one reason for his struggles with the Buccaneers last season. But the Eagles released the defensive end last year not only because of his costly contract. His new role, though, won’t be as a starter, and clearly comfort played a factor in his return. The Eagles did get younger, even though Jackson just turned 29 in January and Curry turns 31 in June. Bennett and Long turn 34 this year. Jackson and Curry have been durable players over their careers, but Bennett and Long didn’t miss a game last year – the latter the last two years. Roseman spoke of developing younger players, but aside from Barnett, little can be expected of defensive tackle Treyvon Hester, who was signed mid-season, and defensive end Josh Sweat, who suffered a season-ending ankle injury in December. The more likely youth injection will come from this year’s draft, considered to be the deepest at defensive line in some time. If, as Roseman said the Eagles “stay true to our beliefs,” it’s difficult to imagine him not drafting a lineman with one of their three picks in the first two rounds.